The cat-fish was commonly used in Chinese iconography from the Song dynasty onwards, because its name, nian, is a homophone for the word for 'year', and also because it has a head shaped like a ruyi fungus. Thus, the visual pun of two cat-fish with the lingzhi forms the auspicious greeting, nian nian ruyi, 'may your wishes come true, year after year', which is particularly apt as a New Year salutation. It also forms the rebus jixiang youyu, a wish for fortune and abundance. On a more basic level, paired fish also symbolise a successful marriage. Another pair of cat-fish is in the Hartman Collection, illustrated by Robert Kleiner, op. cit., no. 190. Cf. also James Watt, Chinese Jades from Han to Ching, p. 104, no. 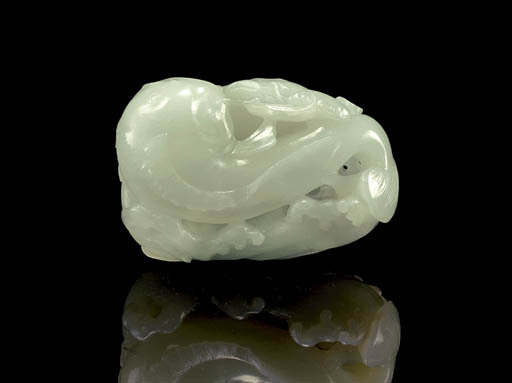 91; and Ip Yee, Chinese Jade Carving, Hong Kong Museum of Art, 1983, no. 194.